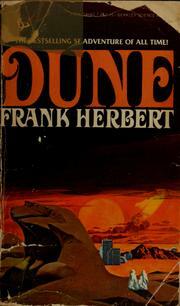 Are you sure you want to remove Dune from your list? Here is the novel that will be forever considered a triumph of the imagination. Set on the desert planet of Arrakis, Dune is the story of the boy Paul Atreides, who would become the mysterious man known as Muad'Dib. He would avenge the traitorous plot against his noble family--and would bring to fruition humankind's most ancient and unattainable dream. A stunning blend of adventure and mysticism, environmentalism and politics, Dune won the first Nebula Award, shared the Hugo Award, and formed the basis for what is undoubtedly the grandest epic in science fiction. This description comes from the 2010 Ace Books edition. in English - 40th anniversary ed. August 21, 1997, Books on Tape, Inc.
January 1, 1995, Plaza & Janes Editores, S.A.
in English - Ace ed. in English - First Putnam ed. in English - Berkley ed. March 17, 2019 Edited by Martha Carroll Edited without comment.